Running with a jogging stroller sounds intimidating at first, but it really is fun. 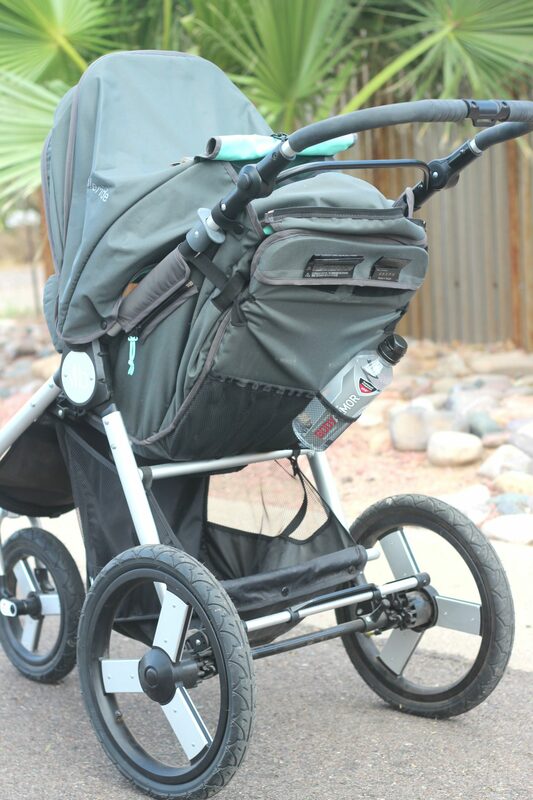 Here are five tips for stroller running with baby. This post is sponsored by Body Armor. Please see the POLICY page for full disclosure. Entertainment ~ Now that the little one is old enough to have an opinion, I try to keep her entertained on our runs. She loves music, so I play it on my iPhone, and stick the phone in the pocket of the stroller so that we can both hear. I also add a couple of toys and some snacks that don’t pose a choking hazard, like yogurt melts and cereal. Talking to her during the run helps too. There are always geese and ducks where we run, as well as happy dogs on walks. I always point out these things to keep her interested and entertained. Pay attention to how you dress the little one ~ While you are hot and sweaty and totally comfortable bare armed in a tank, your little one might have the the cool air blowing on her and might be a little chilled. If it’s chilly out I like to take the little one in her footy jammies, a jacket and a hat. If it’s warm, I’m careful to make sure her legs aren’t too exposed to the sun and always put sunscreen on her. I wouldn’t want her to inadvertently get burned. Check out some of my favorite running accessories! Avoid sidewalks ~ One of the most annoying things while running with a jogging stroller is recycling day. I’m all for recycling and making the earth a greener place, but those bins are in my way! Additionally, the very slight ups and downs of the driveways throw me off, so I just run on the pavement if I am running in the neighborhood. Fortunately, Scottsdale has many paved paths and parks that are great for stroller runs. Hydration ~ Of course you need to be hydrated for your run. Everybody knows that. But stroller running takes extra effort and you get need to stay hydrated. The combination of living in the desert plus the added challenge of running while pushing a stroller can really make you break a sweat. There are many times I have come in from a stroller run with a trail of white salt crystals stuck to my face. I have also gotten pretty sick from not staying hydrated and not keeping on top of replacing my electrolytes during and after my run. Headache, muscle aches, nausea… and those are mild symptoms. Now I know not to risk it, since I don’t have time to feel bad after a run. I love taking BODYARMOR sports drinks with me to drink during and after my runs. I have an obsession with staying hydrated! 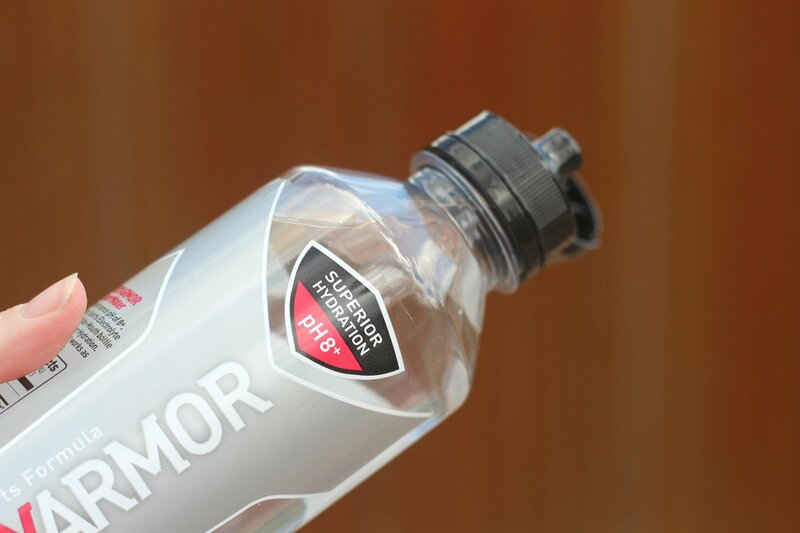 BODYARMOR LYTE sports drinks are high in potassium and low in salt. 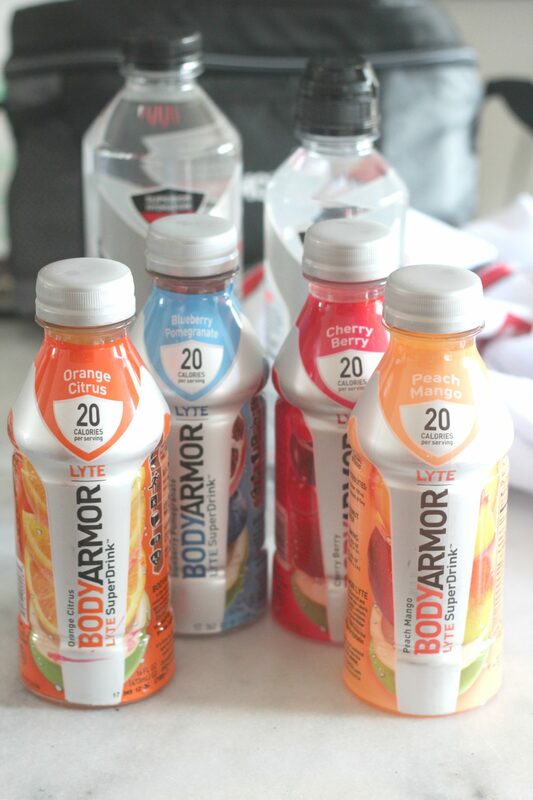 BODYARMOR LYTE sports drink is natural and low calorie (only 20 calories!) It’s made with coconut water, vitamins and potassium-packed electrolytes. BODYARMOR LYTE has natural flavors, natural colors and natural sweeteners (pure cane sugar, stevia and erythritol) and only 3 grams of sugar per serving. Oh and the flavors! Cherry Berry, Peach Mango, Orange Citrus and Blueberry Pomegranate. Orange Citrus is my fave! BODYARMOR has a new SportWater for 2018! The SportWater has a performance pH of 8+ and a proprietary Sports Electrolyte formula. Plus the bottle has a wide mouth, so you can hydrate faster, for when you are really thirsty after that crazy intense workout! BODYARMOR Sports Drink also announced this week that 6-packs will now be available at several retail locations across the U.S. including Kroger, Stop & Shop, Wegmen’s, King Kullen, Food Town and ShopRite. Do you have any tricks or tips for stroller running or just running in general? I’d love to know! Ooh gonna look for that drink! Sounds great. Pinned! Thank you for sharing on Merry Monday! Hope to see ya next week! Totally agree with all of these (except for avoiding sidewalks, but I live in a busy suburb neighborhood and not all of the traffic is courteous of runners & bikers). Just as I was getting in the hang of jogging with my little one, I got pregnant again! My second baby is now 1 year old and I’ve been trying to get back into running. Navigating a double jogger is definitely a challenge. But we made the investment into a really nice one, and I have not once regretted the money we shelled out for the double jogger! When it comes to having two kiddos, having a smooth, good quality stroller really helps make the walk & runs more enjoyable! Yes, I am fortunate enough to live somewhere where I can avoid heavy traffic and still run on the road. I get annoyed because people put their recycling containers on the sidewalks and block the way! Although, I take the stroller on the paved paths at the park more than anything! A double stroller would be quite the workout, that’s awesome! Sounds like a great way to get some exercise. both mommy and baby having fun!! Thanks for sharing with SYC. Thanks so much for sharing at the Welcome Spring linky party. My baby days are long behind me but these are some great suggestions. Pinned.